I come from a long line of emotional eaters and feeders. Good food was the cure-all in my family when I was growing up. (Unless of course you’re throwing up every 15 minutes – then good liquids were the cure-all.) As I’ve mentioned before my mom always had something yummy on the stove or in the oven. If things weren’t going well at school she’d make me cookies when I came home. If I did really well at softball practice she’d make my favorite dinner. But food wasn’t just a fixer or reward – it was a way to express emotions in my house. I had already volunteered to stay home with Madison that night so that Joel could go to a party – something he rarely does when he’s got Madison for the weekend – and I wanted to make our Madison/Naunta night special. I had rented “Toy Story 3” and I planned to make hot cocoa and peanut butter popcorn, (sorry folks – you will NEVER get this recipe. I’m bound by the oath of the Butter Sisters to never share it. Seriously.) but I didn’t know what to make for dinner. I asked Madison and her immediate response was, “enchiladas!” It’s currently one of her favorites and I make it with chicken, sour cream, lots of cheese and not too spicy. This is southern California comfort food at its best. What more could you ask for? Her fever came down the next day. Whether from the rest and liquids or enchiladas, popcorn and cuddly-time we’ll never know. I suspect because of both. Here is the recipe for fever-reducing enchiladas – Madison style. Mix the shredded chicken, ½ cup sour cream, green chilis and Monterey jack cheese in a large bowl and set aside. Preheat the oven to 375 degrees. In an 8” skillet, heat 1-2 tbsp of vegetable oil over medium heat. Working quickly, place one tortilla in the warm skillet for 4-6 seconds and flip to the other side for 4-6 seconds. (it will be easier to stuff and roll the tortillas in the long run if you just hold it with your fingers.) Place the warm tortilla on a dinner plate covered with 1-2 paper towels to soak up the grease. Repeat this process until all 18 tortillas are coated. Be sure not to fry the tortillas otherwise they will dry out when you bake them. Scoop about ¼ cup of the chicken and cheese mixture into the center of a tortilla. Turn part of the tortilla over the filling, roll and place seam side down in an un-greased 10 x 15 baking dish. Repeat until the baking dish is full of stuffed tortillas. Mix ½ cup sour cream with the enchilada sauce and pour over the top of the stuffed tortillas. 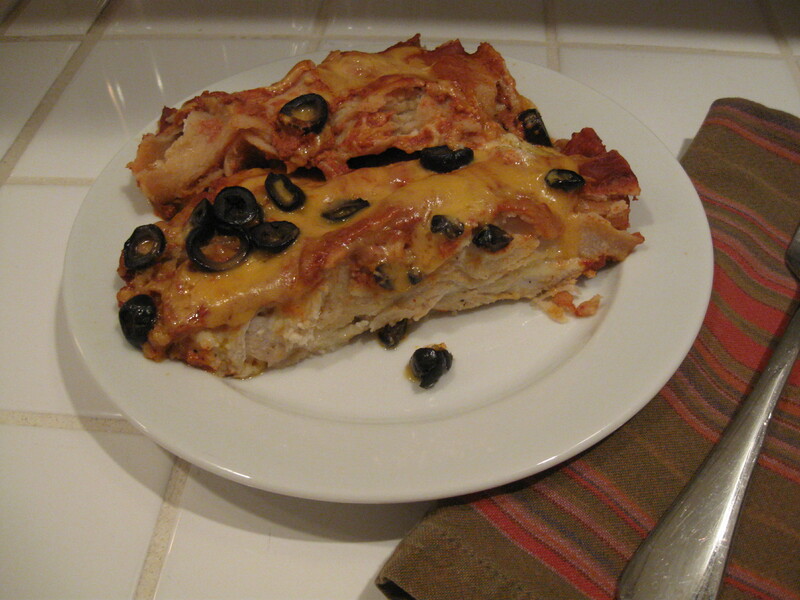 Top with cheddar cheese and olives. Bake for 20-25 minutes, until the cheese is melted.